Geoffrey Drake-Brockman’s work is characterised by robotic and optical technologies incorporated into large-scale interactive installations. He also creates static works in stainless steel and other permanent media. Geoffrey has exhibited in Perth, Sydney, Melbourne, Canberra, Singapore, Denmark, New York, and London. He has shown work at the National Gallery of Australia, The Singapore Art Museum, The Perth Institute of Contemporary Art, the Helen Lempriere National Sculpture Award, and Sculpture by the Sea – in Bondi, Cottesloe, and Aarhus (Denmark). His public art commissions include the robotic sculpture “Totem” at the Perth Arena, “Readwrite” at the NEXTDC Data Centre in Malaga, and “Spiral” at the Western Australian Police Headquarters. Geoffrey studied Computer Science at The University of Western Australia before completing a Master’s degree in Visual Arts at Curtin University. Geoffrey was born in Woomera, South Australia in 1964 and is based in Perth, Western Australia. “My background in Computer Science informs my project to create automata – interactive, self-determined, expressive machines – that test the limits of mechanical (in)humanity. I’m interested in the extrapolation of techosocial trends; such as machines becoming interchangeable with persons”. In his practice Geoffrey combines gothic horror themes with the politics of social determination through technology, and commonplace metaphors such as clockwork music boxes, flower-pots, doorways, origami shapes, and portrait relief. See the artist’s TEDx Talk “Created Beings” in the right hand panel for more explanation. The Coppelia Project is inspired by the story about a clockwork girl from the 1870 ballet ‘Coppelia’ by Saint-Léon, Nuitter, and Delibes, based on a story by Hoffmann. It also draws the commonplace metaphor of clockwork music boxes, with the little ballerinas that pop up and rotate in front of a mirror when you open the lid. Coppelia is part of the traditional classical ballet repertoire and is performed frequently by ballet companies around the world. It belongs to a small group of enduring stories in Western Culture that directly address the limits of humanity when confronted by our creations. The Coppelia story is unusual in approaching this theme through love and attraction, rather than horror and revulsion, as emphasised by Mary Shelly in ‘Frankenstein’. The Coppelia story deals with some of the issues at the edge of humanity; machines interchangeable with persons, love and attraction confused at this boundary. The Coppelia Project has been assisted by the Australia Council for the Arts, Arts WA, The West Australian Ballet, and the many generous contributors to its Idiegogo crowd-funding campaign. See the Sponsors page for details. Geoffrey Drake-Brockman’s goal is to create automata – interactive, self-determined, expressive machines – that once set free, operate to independently explore issues at the edge of humanity; machines interchangeable with persons, aspects of political accountability, love, and attraction in flux at this boundary. Through his practice Geoffrey combines his interest in gothic horror themes, especially Mary Shelly’s Frankenstein story, with the politics of social determination through technology, and commonplace, accessible metaphors such as clockwork music boxes, flower-pots, doorways, simple origami shapes, and portrait relief. The Coppelia Project robots are specially designed to learn and perform the movements of classical ballet. They can spin “en pointe”, move their waists, arms and head. They cannot walk and their hands do not have grippers to pick things up. They are optimised only as ballerina robots. The Coppelia Project robots are taught ballet movements by having their arms, head, and torso physically moved through a ballet sequence by our ballerina trainer. An on-board computer captures the motion so it can replay it later – in various dance move combinations. The Creation of the Coppelia Robots is the cumulation of an extensive research and development exercise undertaken with the assistance of Jayne Smeulders of the West Australian Ballet. Jayne was the model for the robots and assisted the artist while researching the requirements for ballerina form and movement. The Coppelia Project is the ultimate outcome of a series of increasingly complex robotics projects, including “Floribots” (2005) “Headspace” (2010) and “Totem” (2012). 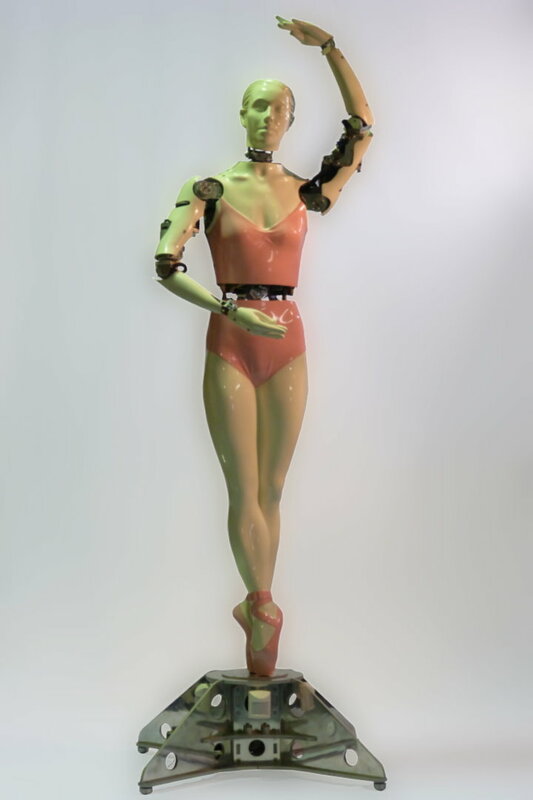 Two other ballerina related projects have also taken place alongside the Coppelia Project, one is “Parallax Dancer” – a 3D virtual dance installation, and the other is “Cockwork Jayne” – a simple windup version of the ballerina robot. More detail on these projects is available at the artists main web site. The Coppelia Project will create a dancing robotic installation that will be exhibited as an interactive artwork installation, become the basis of Youtube video works for a worldwide audience, and eventually provide the foundation for a hybrid performance work – a new ballet written for robotic and human dancers. The next stage for the Coppelia Project is development of a hybrid ballet/electronic stage performance that blends interactive robotics and live dance performance. The work will incorporate the four “Coppelia Project” robot ballerinas and a cast of human dancers in a new ballet that extrapolates from the original 1870 production “Coppelia” to explore visual, narrative, and movement possibilities in the realm of machine / human boundaries – particularly as they pertain to the emotional imperatives of the “robot creator” and the sexual dynamics of attraction between humans and machines. This project will encompass choreography for humans and robots dancing together, creation of sound and music to accompany such performance, and dealing with the technical, production, and staging concerns required to deliver a performance based on a blended cast of interactive robots and live dancers. On Friday the 10th of May 2013 an event “The Coppelia Salon” was held at Geoffrey Drake-Brockman’s studio in Nedlands, Western Australia as the public launch of the first Coppelia Project robot ballerina. 150 guests dressed in period costume witnessed the robot doll dance on-stage to the music of Delibes, with an introduction by dancers from the WA Conservatoire of Classic Ballet, specially choreographed by school principal Beth James. The guest of honour was Jayne Smeulders, who unveiled her robot duplicate in front of the audience. The event was recorded by a photographer from the West Australian Newspaper. I am Geoffrey Drake-Brockman. I’m a full-time professional artist, working primarily with robotics, but also using lasers, and other materials and technologies. I have a technical background (BSc in computer science) and have spent many years in the commercial world as a programmer and as an IT Manager running large-scale IT projects. I’ve also been to Art School and done a Master of Arts degree. I have been working as a full time artist for the last seven years. My “paying” jobs are generally public art commissions. I recently gave a TEDx talk about my art practice you can watch here. Jayne Smeulders – Principal Dancer. Jayne is Prima Ballerina of the West Australian Ballet. Jayne has trained and performed ballet her whole life – essentially her first steps were “en pointe”. The Coppelia Project dolls are based on a full body cast of Jayne. She will participate as dance consultant, and robot trainer. Jayne trained in Germany at Hamburg Staatsoper GmbH Balletschule and performed with Netherlands Dance Theatre II in Amsterdam. Jayne was the 2009 WA Citizen of the Year for services to arts, culture and entertainment. David Veerman – Embedded Systems Design Engineer. Former avionics engineer, robot enthusiast, self-taught electronics and realtime software genius. David is responsible for custom-developed electronics, firmware, and motion control software systems for the Coppelia robots. Ruvan Muthu-Krishna – Mechanical & Software Development. 5th-year mechatronics engineer student who assists with hardware and software aspects of the Project. Ruvan volunteers his time to The Coppelia Project, sighting it as a great application of his studies and example of animatronic art. Chrissie Parrot – Choreographer. Chrissie is a prolific, multi award-winning choreographer. She has worked work for companies including WA Ballet, Synfionetta de Lorraine France, Tanz Forum Cologne and Theatre Vorpommern in Stralsund. Chrissie is fascinated by the Coppelia story and has choreographed her version of Coppélia for WA Ballet.